Hands down, my favorite building in Manhattan is the historic Flatiron building. Why? Not only is it an architectural marvel, but I’ve always associated it with Guitar World because our offices have always been within blocks of this triangular triumph of a building. Also, if you’re not a native New Yorker, you might not know that Broadway and Fifth Avenue intersect at the Flatiron on 23rd Street, splitting them on opposite sides of each other and essentially making this landmark the crossroads between Midtown and Downtown. 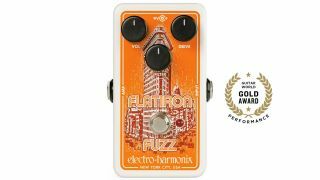 So, when I heard Electro-Harmonix created the Flatiron Fuzz, I just had to have it based on its name alone! And, interestingly enough, the analogy here seems apt: The Flatiron Fuzz is a crossroad of fuzz and distortion and combines both in a very natural and musical way. Is it fuzz or is it distortion? Well, the Flatiron Fuzz is kinda both. It’s a Seventies-style circuit with symmetrical hard-clipping, features controls for drive, filter (Low pass) and volume, and is powered by a 9-Volt battery or 9VDC power supply. EHX admits it’s their take on a Rat 2 distortion pedal, and as someone who owns a couple of those Rats, I certainly hear the inspiration in its gnarliness, but it’s nowhere near it. Where the Rat 2 has a range of distorted textures that approaches fuzz, the Flatiron Fuzz is more focused in its fuzzy gain structure that blends Big Muff Pi fatness to notes with a granular, upper-mid distorted grind. The Flatiron Fuzz works best by finding its sweet spots. Setting the filter between 11 and 2 o’clock is ideal, but anywhere outside of that, it’s either sharply bright or too dark. The drive control spans the breadth of distortion and fuzz, with a Ted Nugent “Cat Scratch Fever” chug from noon to 3 o’clock. Anywhere clockwise from there is a full-on melange of fuzz and saturation that sounds glorious. It sends single notes into feedback, singing into the upper octave — especially with amplifiers that use 6L6 tubes.